The TSG-51 provides an economical means of obtaining high quality SD NTSC RS-170A composite video test and alignment signals and patterns. The TSG-51 generates twenty four computer calculated and digitally synthesized test signals, including blackburst, SMPTE color bars, frequency sweep, NTC-7 composite and others. The TSG-51 also provides a 1KHz/400hZ audio tone output, composite sync, and a color Field-1 reference pulse, plus other optional user selectable signals. 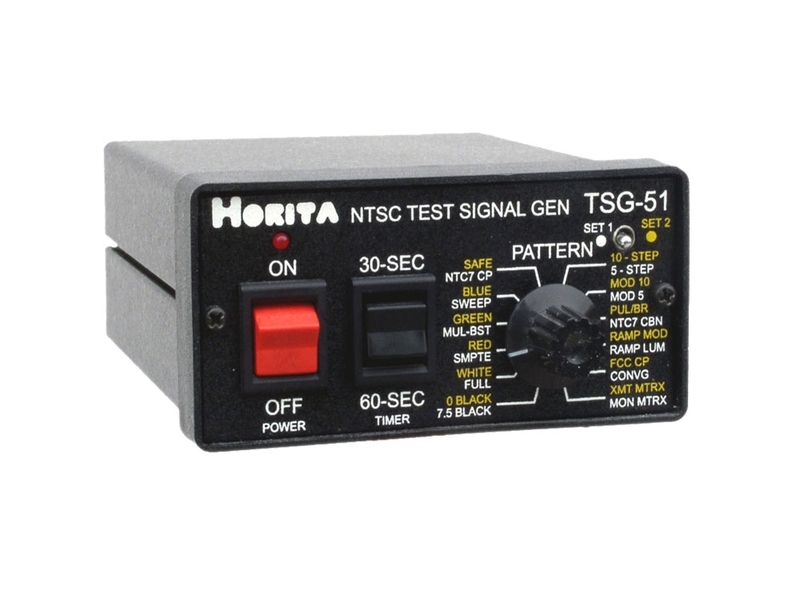 The wide range of signals available from the TSG-51 allow it to be used in a variety of applications to perform checks, measurements, tests, adjustments, and alignments of composite video equipment and distribution paths. These include measuring gain, equalization and luminance-chrominance delays, checking video monitor convergence, gray scale tracking, hue, saturation, purity, adjusting composite video transmitter power and response, etc. 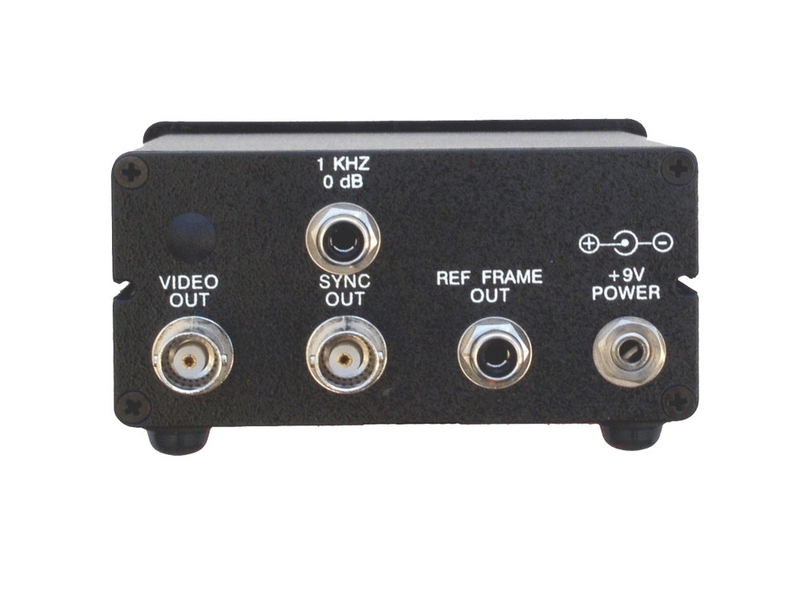 When used with a video distribution amplifier, the TSG-51 can serve as an excellent dedicated "house sync" generator in a video editing or production system to synchronize operation of various video switchers, special effects generators, VCRs/VTRs, cameras, monitors, video edit controllers, video titlers, time-base correctors and frame stores, SMPTE time code, and other types of professional video equipment. An added feature of the TSG-51 is an internal 30/60 second timer which switches the video output to black and the audio output to silence after the preset time has elapsed. And, because it can operate from batteries, the TSG-51 can also be used in portable situations in the field. Black burst signal at 7.5-IRE and 0-IRE. Full Field and SMPTE split-field color bars. White, Red, Green, and Blue flat fields. Multiburst and 0.5 to 5MHz frequency sweep (with markers) signals. NTC-7 Composite and Combination signals. 5-Step and 10-Step modulated and un-modulated stairenclosure signal. Modulated and un-modulated ramp signal. 17H x 14V Crosshatch pattern with center/safe markers. Monitor and Transmitter test matrix signals. 1KHz/400hZ 0dB audio tone output. Composite sync and Reference Frame output signals. Rugged aluminum desktop enclosure measures 1.75"high, 4.7"long, 3.8"wide.